Bali Tanah Lot Kintamani Uluwatu Tour is part of Bali Full Day Tour Packages we have by combining three most famous tourism site in Bali in to single day trip, this tour will visit Tanah lot temple, Kintamani with mount batur view and the last is the Uluwatu cliff temple. This tour is perfect choice for those have limited time to explore Bali but want to visit the most important and famous site. First journey will start upon our driver pick up at hotel with comfortable and good AC licensed private car. 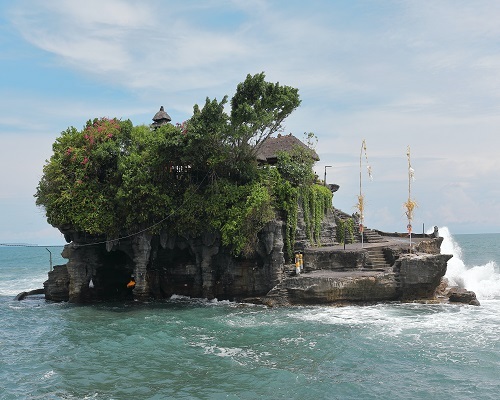 First site we will visit is Tanah Lot Temple in the west Bali islands, the temple located in small rock in the sea, if the water high tide, you will see the amazing view of temple floating in the sea. Then the journey continue to the center of Bali islands to visit the Kintamani village to see the breathtaking view of mount batur active volcano and the lake batur, you will having lunch in Kintamani, while having lunch you will enjoy the amazing view from the restaurant, take picture as many as you like and is totally free. Then we driver to the south Bali islands to visit Uluwatu cliff temple, before reach the cliff temple, we will visit the tegalalang rice terrace in northern ubud, is beautiful rice paddy in small valley, then we continue the trip to visit the uluwatu temple. Uluwatu temple is the cliff temple located in the south in the high of 70 meter high and lives thousand monkey around the temple. You will enjoy the beautiful sunset view from this temple, and then we will walk to the open air theater to see the kecak dan fire dance performance, is Balinese dance performance taking story from Ramayana legend. Then after finish the dance we will drive to Jimbaran beach to enjoy the delicious seafood dinner on the beach. Our professional Bali Tour Driver will always make sure you enjoy your journey in this Tanah Lot Kintamani and Tanah Lot Tour. Below is the description of place of interest we will be visit and the price. Tanah Lot Temple is a Balinese Hindu temple on the stone seen amidst ocean. Is a sea temple located at Braban village Tabanan, it has fascinating view of temple and ocean, a standard vacationer and social image for photography and general exoticism. This haven is to an awesome degree dumbfounding in the specific of the dusk time. We can see this asylum from a few spot focuses with dazzling perspective of the sea. We will discover the haven a float on the seawater when the water is going tide in light of the fact that this temple will be incorporated by the seawater. Kintamani Village is a name Village in Bangli Regency, become the most visit for see the fascinating view of Mount Batur Volcano view from kintamani village. We can see wonderful scene from Kintamani Village to diagram the dynamic abundance of Batur Mount and wide Lake of Batur in a valley. It is arranged in the level range with cool climate encompass it. When we remain up at Kintamani, we will have the capacity to see the rustic zone which is near to the lake. We can watch staggering characteristic landscape of Penelokan, a mix of Mount Batur and the spread of dark rock with Lake Batur and on a blue caldera. Tegalallang is village in northern Ubud, the most famous in this village is the beauty of rice terrace, located right beside the street to kintamani. Become the most place for stop to admit the remarkable view of rice terrace. This site well known with name Tegalallang Rice Terrace, is the excellent rice patio vacation destination situated in slope manage an account with tremendous perspective of rice paddy. In this spot, you will see the Balinese agriculturist do their rice field in sideways zone complete with its structure watering framework. You will admire the astounding scene of valley with rice patio and coconut trees. Uluwatu Temple is one of Balinese Hindu Temples found right on the petrifying slope with the chasm exist in the privilege and left side. Uluwatu sanctuary is one of the greatest ocean sanctuary in Bali, this sanctuary most went by traveler to appreciate the entrancing perspective of nightfall. Uluwatu Temple sits on a 70-meter-high bluff projecting above Indonesian Ocean. Uluwatu sanctuary is exceptionally astonishing and there territory likewise the gathering of monkeys staying the little backwoods around the sanctuary. They are accepted to watch the sanctuary from terrible impacts. Kecak and Fire Dance Performance is customary Balinese move which dependably perform at night, the kecak and flame move we will visit found right next to the Uluwatu sanctuary. is a staggering customary hit the dance floor with the gathering of individuals playing this hit the dance floor with flame diversion. It is exceptionally energizing and remarkable move because of the sound of gamelan is not utilizing the typical gamelan but rather utilize their mouth. The dance experts make the minimal choir with the flawless move development that is one of this move highlights. Jimbaran Beach is the famous beach for enjoy the romantic dinner on the beach, is located in jimbaran village which is most know as a fisherman village, in this village produce fish, crab and lobster. In this beach you will enjoy fresh seafood dinner with the romantic situation and is perfect choice for honeymooner or celebrate anniversary. The table was setup ring on the beach in the white sand with candle in the table make unforgettable moment for dinner. The chefs in the restaurant prepared secret received which make the seafood more delicious.